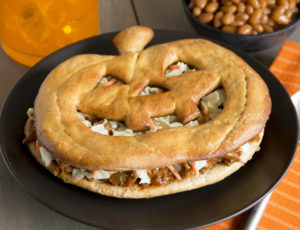 Brew a cauldron of stew, soup, or chili, served in a golden pumpkin bowl complete with a stemmed jack-o-lantern lid. Cut off a small piece of dough to use for a stem and set aside. Shape remaining dough into a ball. With a knife, cut the ball from top to bottom (1/2 inch deep) 6 times to imitate pumpkin sections. Using the handle of a wooden spoon, poke a deep hole into the top of the bowl down to the base. Shape the cut off piece into a cone and insert the small end into the hole. Place on a sprayed baking sheet and cover with sprayed plastic wrap. Let rise until double. Remove wrap and bake at 350°F 20-30 minutes. Let cool, then cut off the top. Hollow out the pumpkin and fill with your favorite stew, dip, chili or soup. For 2 smaller pumpkin bowls, cut loaf in half widthwise, use 6 dinner rolls or 4 Texas rolls and follow instructions above.